This past weekend, I got to make another take on a Minnie Mouse cake. My last one was something I came up with myself, but this one has been done a lot of times before. You only need to Google “Minnie Mouse cake” to see a million takes on this theme. But this cake was special to me because it was for my friend and former college roommate. She referred me for her own baby shower! I had already had a cake lined up, but this cake was important to me, too, so I had to make it happen. My friend and I are both pretty big Disney fans–though I would say her even more than me! 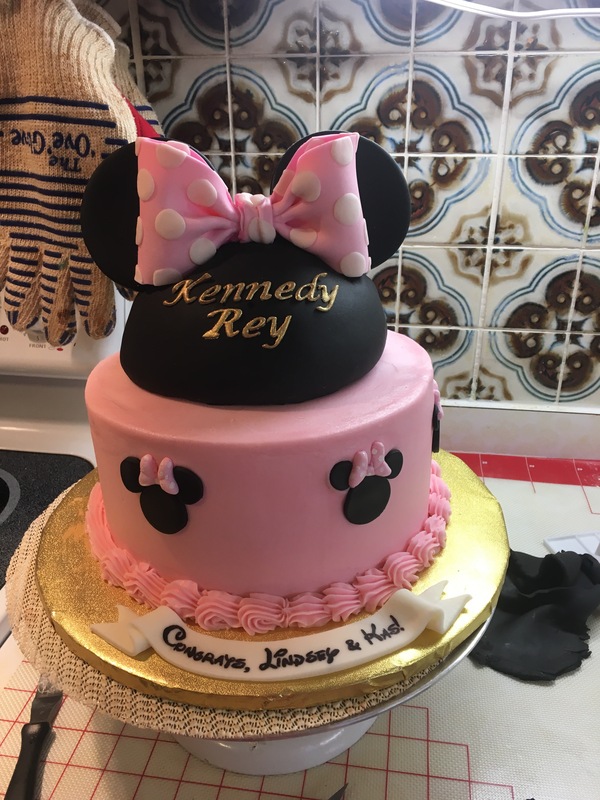 So her friend was planning a very sweet light pink and gold Minnie Mouse themed party in celebration of her new baby girl who is on the way. 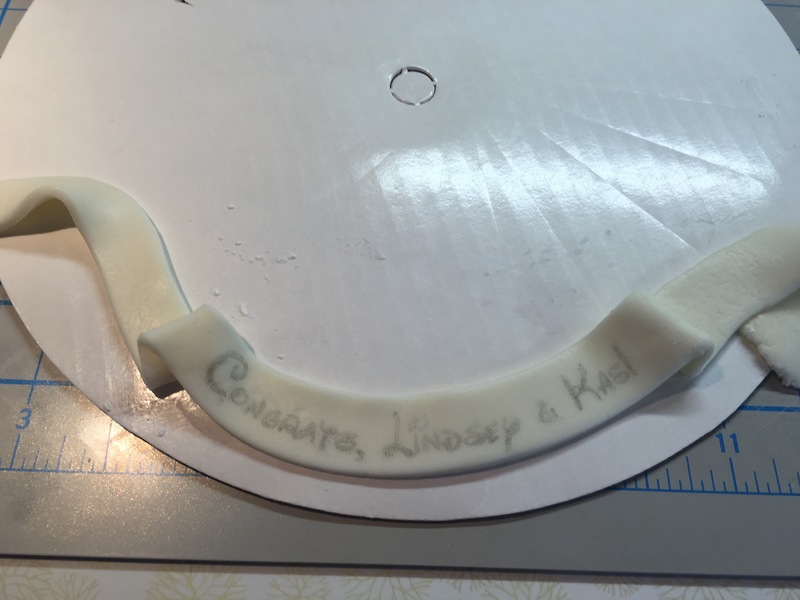 Anyway … The first thing to do was make THE perfect realistic bow out of gumpaste. I like Satin Ice gumpaste these days. For my first attempt (above), I tried drying it on the pan that I would be using, but that failed miserably. I didn’t like how imperfect it looked. And it looked sad and droopy. So then I was DETERMINED to make a perfect bow. And I decided to dry it flat. It took about four tries (!!! ), but I finally got it right. When it was dry, I cut very thin white fondant and added my dots. I tried to space them nice and uniformly. For the ears, I cut pretty thick circles out of black fondant and inserted toothpicks. 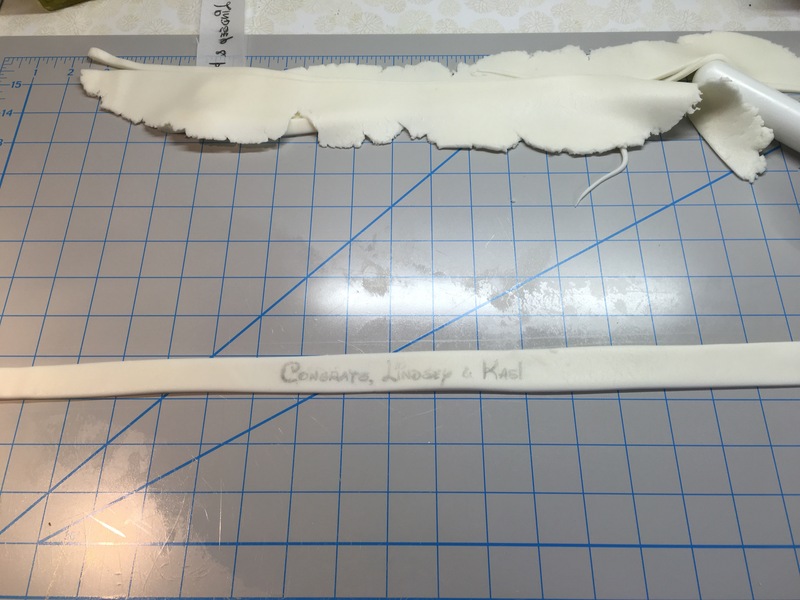 I flattened the bottom so they would conform to the curve of the head. I was very careful to make sure the ears were the right size. If they’re too small or too big, they look weird. An important element of this dress was making a ribbon in Disney font, actually called “Waltograph”. I download my fancy fonts for free from Dafont.com. It’s something I have done before and is always a real hit with people. It is relatively simple to do. You have to rotate your words so that it is a mirror image. Then you trace your words onto parchment paper with a number 2 pencil. Next, you gently rub this onto your fondant, and be careful not to let it move! What you should have is a perfect copy of your special font! 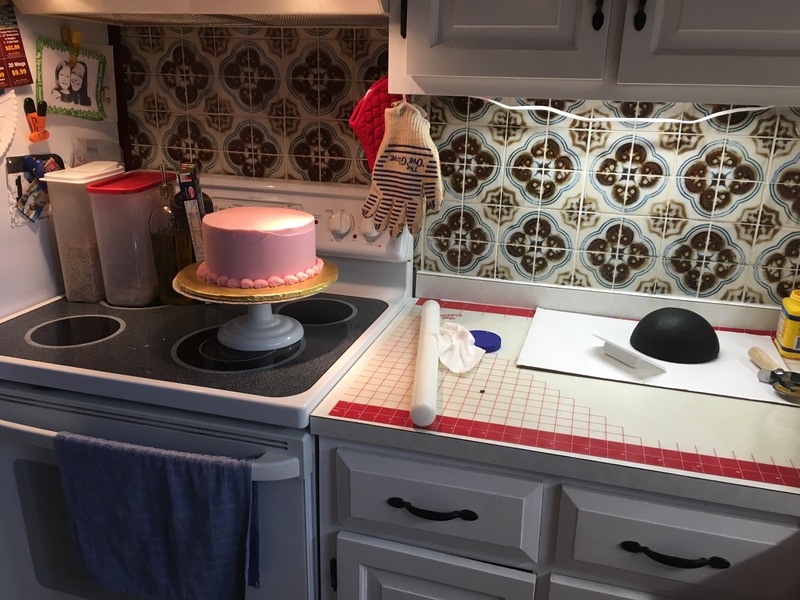 Next, I cut and re-arrange my fondant. That way, I don’t mess up my painting or writing over my letters. I have painted over it in the past using food coloring, but this time I tried using my favorite AmeriColor markers. And it worked beautifully! My customer was so happy that she said “that is on point!” Ha! 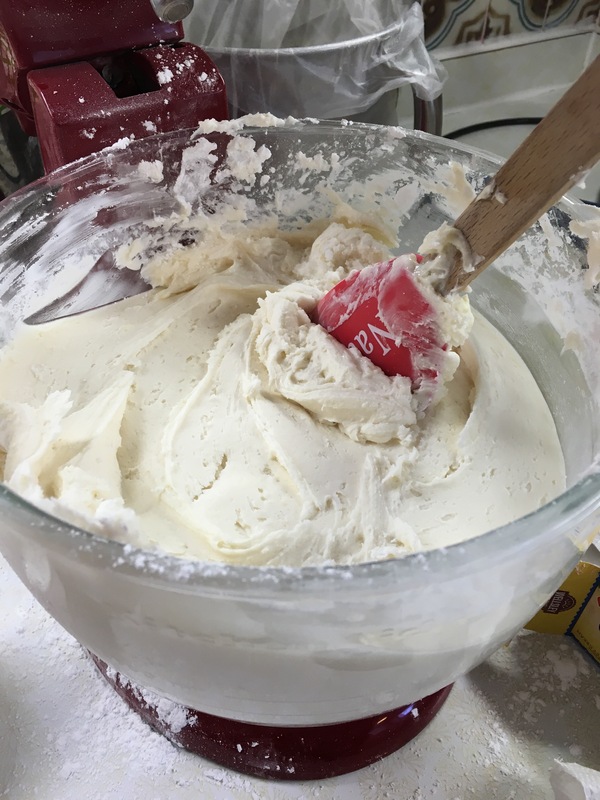 With my cakes all baked (for both cakes) and the decorations ready to go, including the cake boards, I made two HUGE batches of buttercream. I kept one plain and colored the rest. I was going to make them both light pink, but I ended up having to make two different pinks. The first thing to do was fill and crumb coat. I barely had enough white saved! Guessing how much to color is so difficult at times. 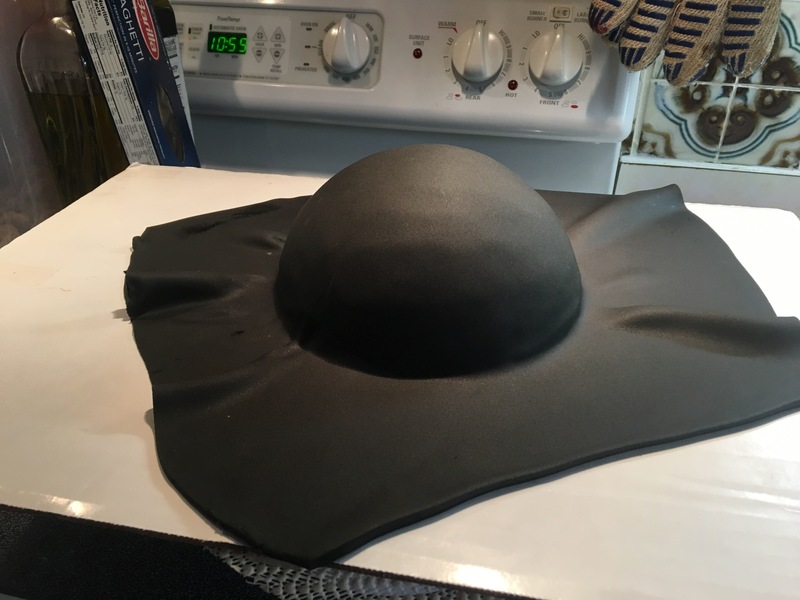 Covering my 6″ dome is one of my favorite parts of making these cakes. 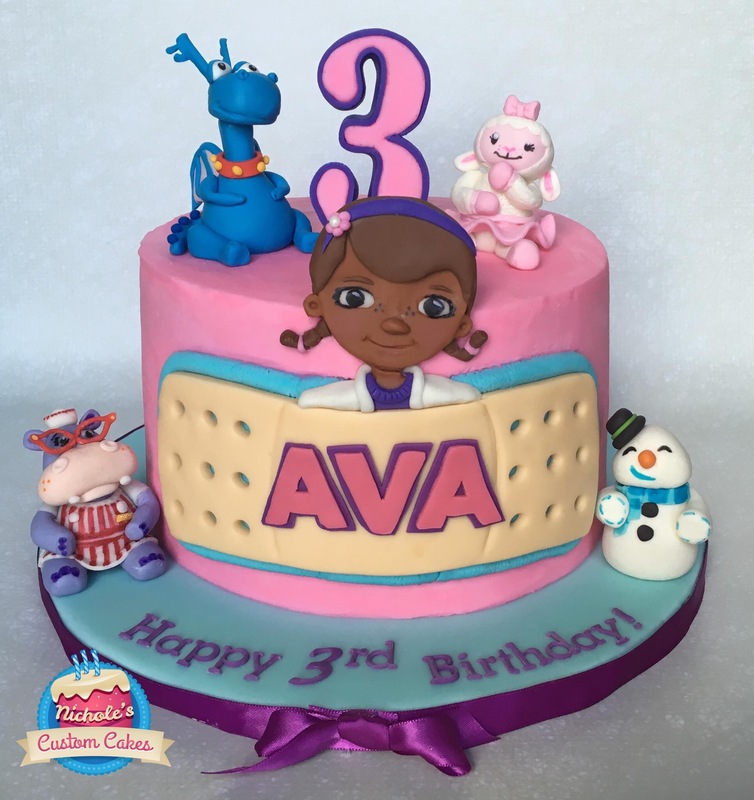 You roll your fondant nice and big – always good to play it safe – moisten your dome, and cover your cake. 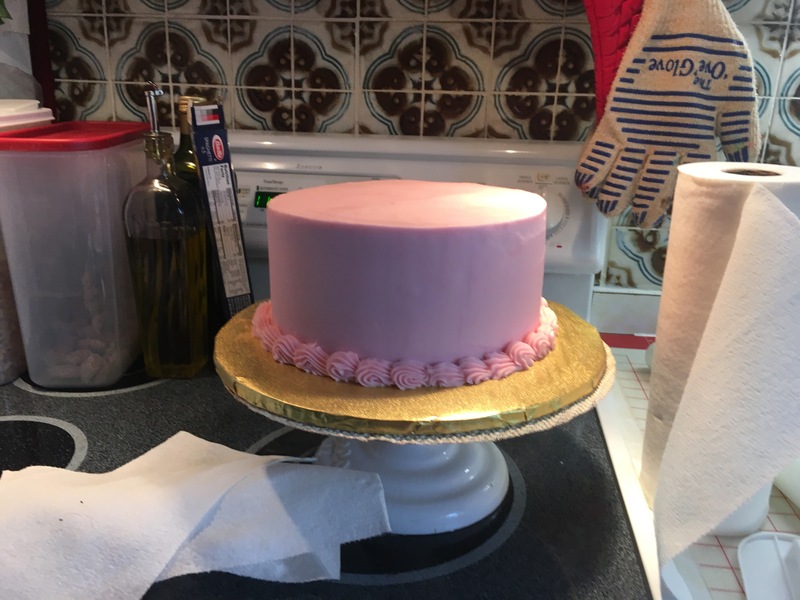 Then you smooth it out with a fondant smoother and get ready to cut it. And you can save any fondant that didn’t come into contact with the cake. To ensure that it’s perfectly covered, I like to wrap it around the bottom. It gives it a very clean look without having to add a border. After my cake was out of the fridge for a few minutes, it was crusted over, yet soft enough that I could smooth it out some more with my Viva paper towels. I added my dowel rods so that it wouldn’t sink, put on some buttercream to act as “glue”, and put the dome on top. From there, I forgot to take pictures because I wanted to concentrate! 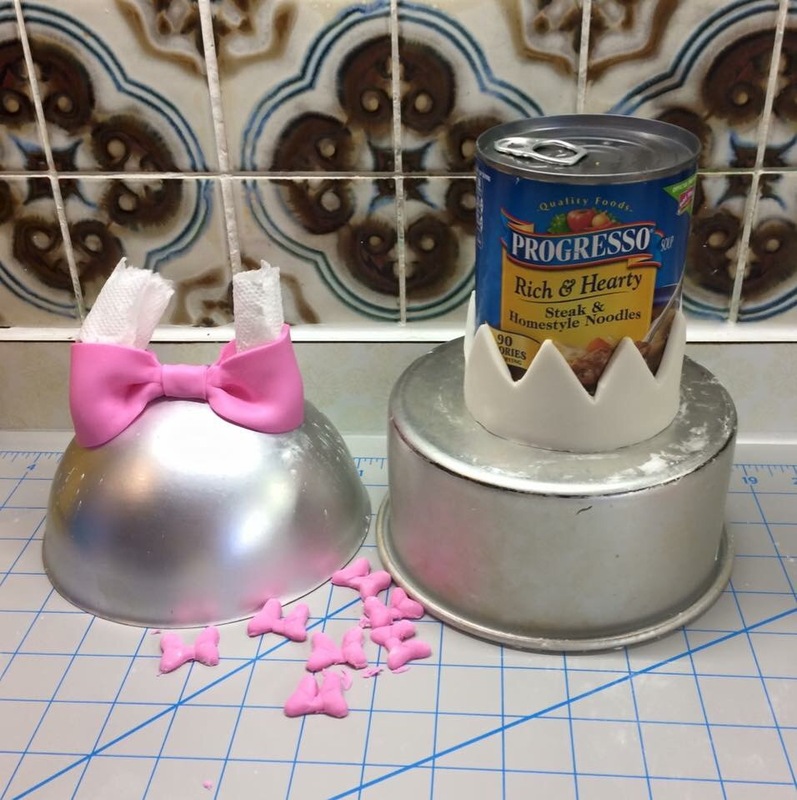 All I had to do from there was cut my small Minnie Mouse heads, add the bows, and add the ears and bow. 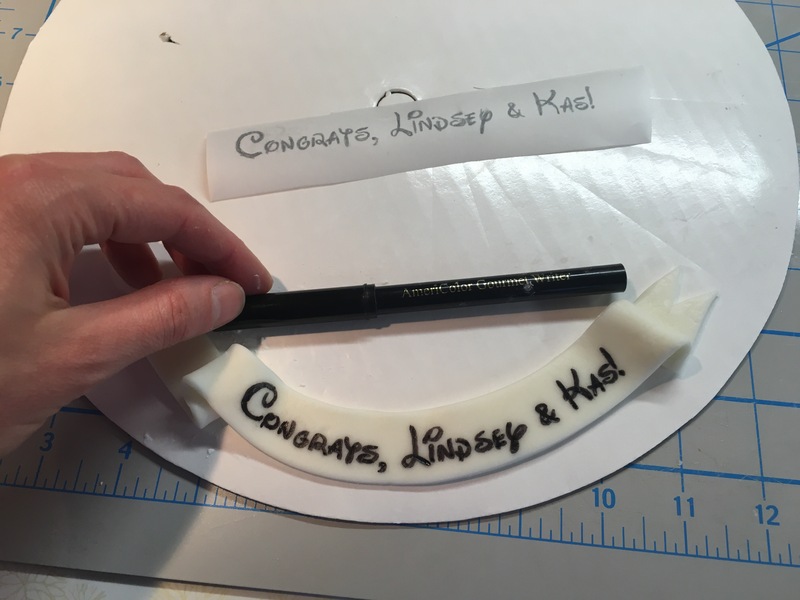 I wasn’t sure how best to get the bow to stick, but I had an idea to wet some black fondant and kind of wedge it in there. And that worked well! I tried to cheat on my letters and take a short cut and that didn’t work at all! I tried to put on my white letters and paint them gold. I knew I should have painted them the night before, but with so much going on, I sort of forgot. No, I actually forgot. I ended up having to take off the letters, paint them, and let them dry. 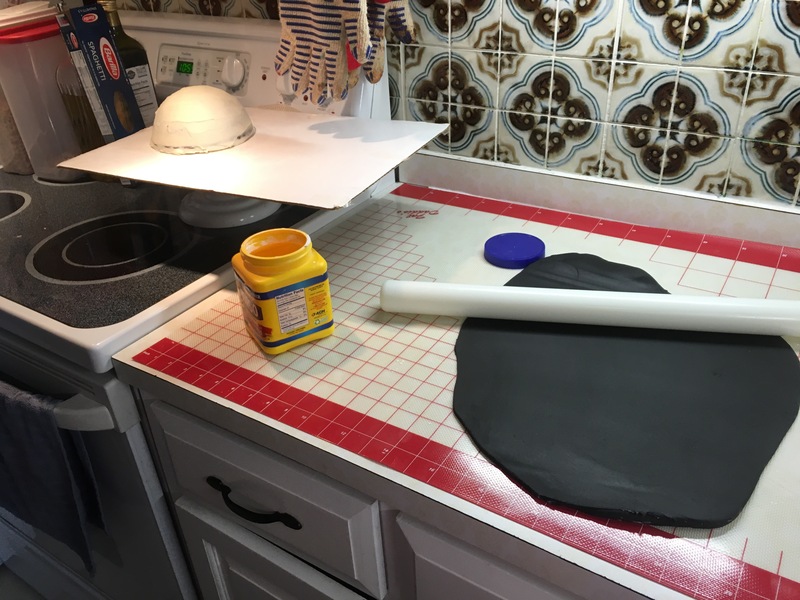 I messed up my black so I rolled out some fondant very thin and re-covered it. Then I put my letters back on. Phew! Don’t take short cuts, ever! My two older kids would not settle that night, and I was the only parent home, so I got a little flustered! My border isn’t what it has been lately, but that’s okay. No one cared except for me! 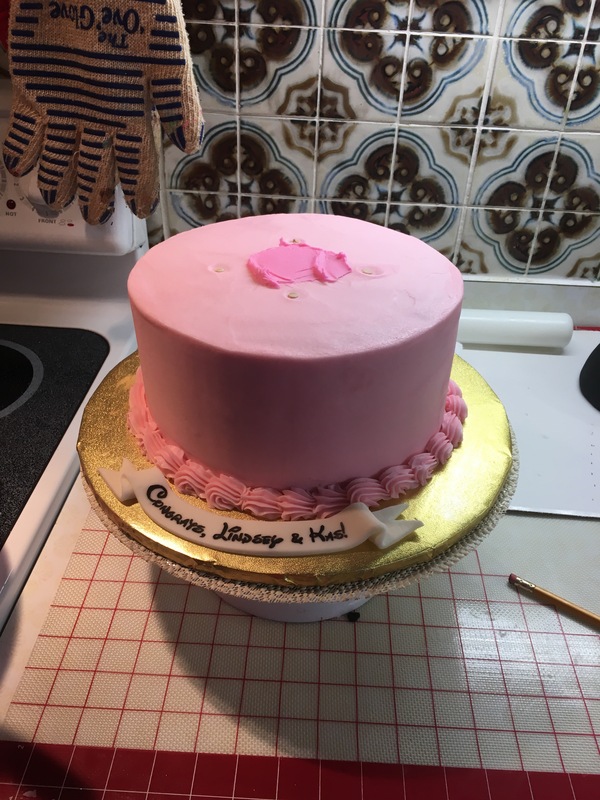 I didn’t cover this cake board since the theme was not only Minnie Mouse, but pink and gold. So I kept it. I love when customers send me photos and this is the darling display that was sent to me. Isn’t it so cute? And my other cake turned out great, too! I am so glad that I didn’t turn down either of these orders. It was a tough week getting it all done because I am such a perfectionist and I can see every little flaw. But I made a plan and got it to work! I learn a lesson with every cake and with this cake I re-learned a lesson once again: no short cuts! ← 3D Coca-Cola Cake Troubleshooting!